Allow me to introduce you to my favorite gardening tool. There are no moving parts. It’s just a blade and a handle. A decidedly manual tool — this thing doesn’t work unless you work it. It wouldn’t be exaggerating at all to say I use it nearly every time I work in the garden. We Americans might call it a soil knife, but its real name — hori hori — comes from the Japanese word “hori,” which means “to dig.” I’m not sure of its exact history, but some accounts claim it was an early tool used by farmers in Japan while others suggest it was used by bonsai enthusiasts to harvest small trees from mountainsides. I’ve even read some claims that the tool’s weapon-like appearance is not accidental, and that it doubled as a self-defense tool for farmers while working their fields. Based on the multi-functionality of this simple tool, I have no trouble believing that all of these accounts are true. My favorite model is simple and sturdy, with a wood handle and a stainless steel blade: Japanese hori hori. It’s light weight and super tough — I’ve abused mine for several years now, and it’s still going strong. Other options include a plastic-handled version by Fiskars , and a model with a carbon steel blade. I’m partial to the wood-handled version, but I’m old school like that. Go with what you think will fit your habits the best. Once you have your hori hori, it’s time to put it to work! Slicing little weeds. Just slide the flat edge of the blade along or just below the soil’s surface, and it’ll slice right through the tender stems and roots of young weeds. This motion quickly becomes second nature — I do this every time I set out a seedling without even thinking about it. Chopping big weeds. Like a mini machete, this tool will hack right through the thick-but-tender stems of many taller weeds, including thistles, poke weed, and more. Digging out tap roots. Got a deep-rooted weed problem? Here’s your answer. I will slide my hori hori into the soil just adjacent to the weed I’m removing. Then, I lean the handle away from the weed — which pushes the blade toward the weed’s deep-reaching root — while giving a gentle tug on the offending weed. Often this will pop out the root. If not, just try again at a few more spots around the plant. Even if you don’t get the entire root, you’ll often remove enough to eliminate that particular weed. Planting seeds. The tip of the blade is excellent for drawing out long straight rows for planting greens, carrots, peas, and more. 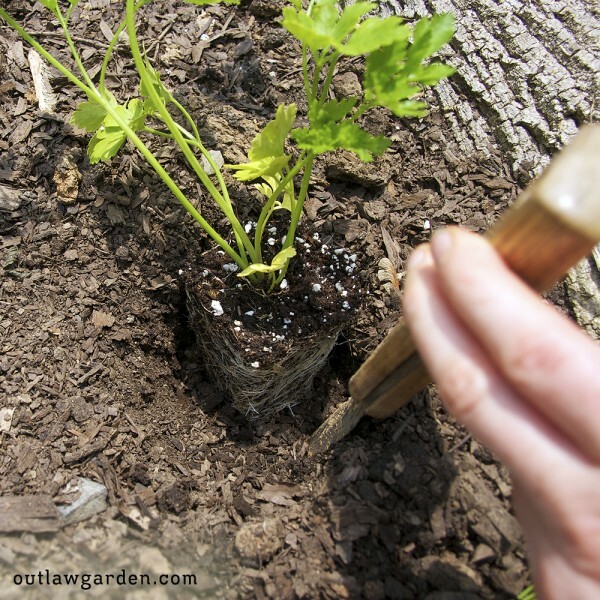 For bigger seeds, just use the tip to carve out a small planting hole. Plant your seeds and use the blade to pull soil back over them. Done. Setting out garlic, onions, leeks, and small-potted seedlings. Simplest thing in the world. Just jab your blade straight into the soil, give it a little wiggle to loosen things up, and then pull it toward you (keeping it at the same depth). You will have created a small hole about 4-6 inches deep. Just drop in your garlic clove / onion set / onion / leek / seedling. Then pull your hori hori straight up and the soil will mostly fall right back into its hole. Give it a little help with your hands if necessary. Transplanting larger seedlings. Most gardeners grab a trowel for this chore, but a hori hori will make quicker work of things. Simply jab your blade into the ground in several places around where you’ll be planting your seedling. Wiggle it around and lean back on it so that the blade is pushed forward and upward. This quickly loosens a volume of dirt. Just pull that out by hand — using your hori hori as a scoop if desired — and you’ve got a nice hole for your larger seedlings, such as tomatoes, peppers, and eggplants. This is the technique I use in the video in this post: How to Plant a Seedling. Harvesting root crops. Some root crops are best harvested with a digging fork, but that can be overkill if you only want to harvest a couple beets, onions, or heads of garlic. This works much the same way as planting a seedling, but in reverse. Jab your hori hori into the soil near your plant — close, but not so close that you will spear the root. Wiggle it around a bit and lean the handle back so that the blade will lift up and toward the root, all while pulling gently on the plant. If your soil is super-loose, you may only need to do this once. Most of us will need to jab and wiggle in a few places for each root. With a little practice, you can quickly harvest a bunch of root crops with minimal damage using this technique. Marking rows. Need something to anchor a string so you can mark out a straight row for your seedlings or beds? 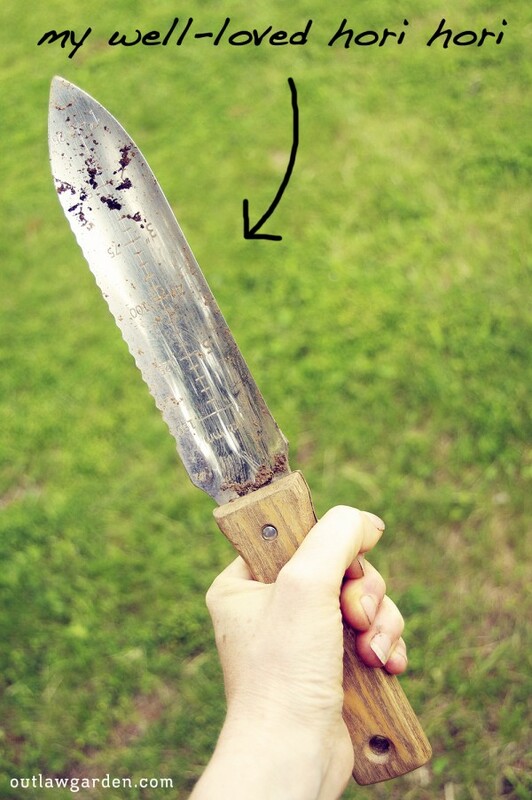 Just jab your soil knife into the ground at one end of the row, loop a string around it, and walk to the other end. Pull it tight, and you’ve go yourself a straight line. Loosening soil. If you’re loosening a lot of soil — say a whole garden bed’s worth — you will want to use a good digging fork. But, if you’re working in a smaller area, perhaps even a larger planter, your hori hori is the perfect tool. With a few jabs and wiggles, you will have loosened compact soil, opening up space for air and water and roots. Removing stumps and roots. There’s nothing fun about digging out the stumps of old shrubs, or dealing with a big root where you want to dig. The hori hori obviously can’t handle this job on its own, but it can help a lot. Through way too much trial and error, I’ve learned the easiest way to remove big roots with hand tools is to use a little finesse. When you hit a root that’s too big to slice with your shovel, that’s when you want to reach for the hori hori. Use the tool’s blade to pull dirt away from the offending root until you’ve created a space around the entire root. Then, grab your limb trimmers or a pruning saw, and attack that root. The soil knife doesn’t remove the root for you, but it helps prep the work space so that you can get at the root with your pruning tools. This can be tedious, but it does work. And that’s it. Now you’ve met my favorite gardening tool! 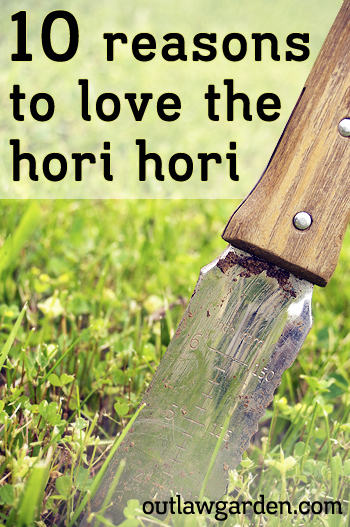 Do you also use a hori hori or soil knife in your garden? Click here to share your comments below. Cristina; Around a week or so ago on your post about your eBook you have I asked the question whether it could be downloaded to a Kindel or not and I have not seen a response to the question; so did you get it? I would like to know as I had rather download it there rather than my PC. Thanks for your time. Alice..
Hi Alice — Yes, I did get your question, and left a response: http://www.outlawgarden.com/2014/05/15/sweet-potatoes-an-outlaw-garden-grow-your-own-guide-for-beautiful-edible-rule-breaking-gardens/. The short answer to your question is: “It depends.” Some newer Kindles can read pdfs, but older models cannot. I am working on a Kindle version, and hope to have that completed soon. Likely next week. I’ll post something on the website when the Kindle version is available. This hori-hori looks like a good tool for helping to deal with sedge (nutgrass). You can remove the offending weed and perhaps get down to the nut (which can be as deep as 12 inches). The problem is the baby nuts that are growing at a right angle from the mother. But, with tool, one can keep chopping the tops of the nut grass and ultimately, they will run out of energy. A local farmer told me that his pioneer family built a large house in the middle of their property and surrounded it with fruit orchards. Finally, after 140 years, the old house was torn down. Immediately, nut grass popped up everywhere withing the rectangle where the house had been, hard to believe that the momma nuts would keep that long. The family had to fence in the rectangle to keep the weeds from spreading into the nearby orchards. The ultimate tool to get rid of the weeds was a bunch of hogs who rooted out all of the nuts; they loved them. So, if one does not have a hori-hori, get a hog. Ha! Not sure I could get away with a hog in the front yard, John. 😉 But, yes, the hori hori is excellent for nut grass. I’ve got a small infestation, and am slowly making progress with its removal. The blade is long and strong enough to get the nut about half the time. It’s also great for popping out dandelions, thistles, and other deep-rooted weeds. Grow Your Own Sweet Potatoes! I grew 67.8 pounds of sweet potatoes in my garden. You can too! 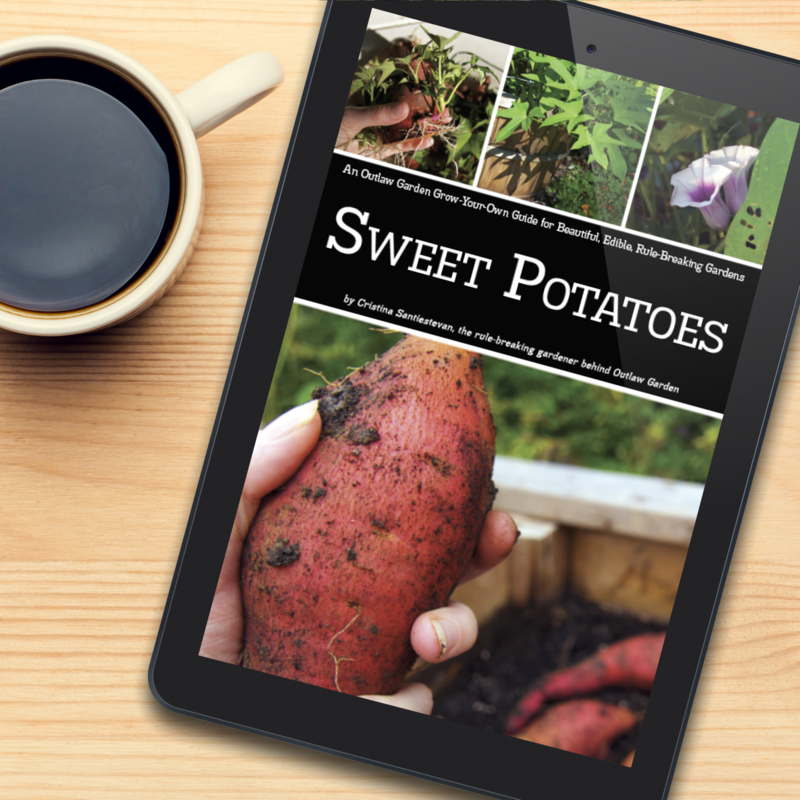 >> Get the Sweet Potato Grow Guide today! Hello, and welcome to the Outlaw Garden! My name is Cristina Santiestevan, and I’m the outlaw gardener. I break the rules by growing vegetables in my suburban front yard, even though my HOA (homeowners association) says “no.” You can do the same — explore the site to learn how! A New Spring and a New Look for Outlaw Garden.